My favorite part of reviewing new music is that I am able to discover artists that I might never have found otherwise. One of the things I dislike about being a reviewer is that I rarely have a chance to go back and listen to music just because I want to hear it again. 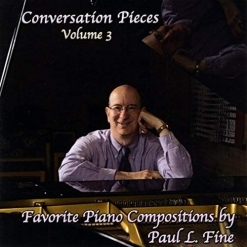 Paul L. Fine’s new “best of” compilation, Conversation Pieces, Vols. 1 & 2, and 3 (reviewed separately) is a wonderful reminder of how much I have enjoyed Dr. Fine’s music over the past thirteen years (I’ve reviewed all ten albums leading up to this one) and it also gives me the perfect reason to revisit a large collection of his recordings. Much of Fine’s music has an old-fashioned feeling about it and often conveys the innocence of a simpler time. Most of his music is solo piano, but some pieces include other instrumentation and few songs have lyrics. Fine has been writing music since he was six and often composes in honor of special events and special people in his life. I have always been very impressed with Fine’s versatility as both a composer and a pianist, as his music falls into genres that include classical, ragtime, pop, jazz, blues, romantic, Latin and novelty songs. Quite often, it can’t be categorized at all - something I always appreciate! 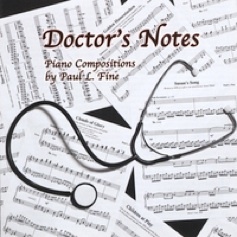 Also a medical doctor and an associate professor of Internal Medicine at the University of Michigan, it is amazing that Fine has had time to create recordings of 138 instrumental and vocal pieces. Lucky us! The first two volumes of Conversation Pieces contain a total of thirty-five pieces (at least one from each of Fine’s previous ten albums) for a very generous two hours and 37 minutes of music. To be able to include so many compositions, Fine has edited many of them by taking out repeated sections. The liner notes are extensive and explain the inspiration and origin of each of the pieces, some of them dating back to college years. My own favorites are the ragtime and bluesy pieces, and many of those are included, but I love variety that Fine presents us with. His versatility has been apparent in each release, but to have a big collection like this really gives listeners a chance to hear just how creative Fine is. 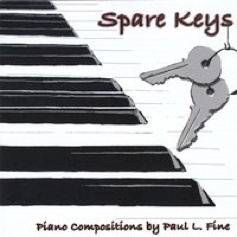 As I mentioned, much of Paul Fine’s music is written to honor and/or celebrate special occasions and special people, and those pieces range from lighthearted and even funny to music written as a warm welcome to a newborn or as a memorial for someone who has died. There are songs about snow days, chases, mechanics, shadows, school spirit, mowing the lawn, and so on - life! There are obviously far too many tracks to go into detail, and they are all so different that I don’t even know where I’d begin! 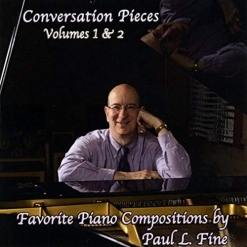 If you aren’t familiar with Fine’s music, these Conversation Pieces are an excellent place to start! If, like me, you have all ten of his previous albums, these compilations contain highlights chosen by the artist himself and most are somewhat different from the original recordings. Great stuff! Conversation Pieces, Vols. 1 & 2 is available as a two-CD set or downloads from Amazon, iTunes and CD Baby.